Fly Fish in the Shadow of History...How does that sound? Nestled amongst the rolling hills of Valley Forge National Historical Park is a true hidden gem of the Montgomery County and Valley Forge area. Step back to a time when the troops of our young nation honed their skills into an elite fighting force. 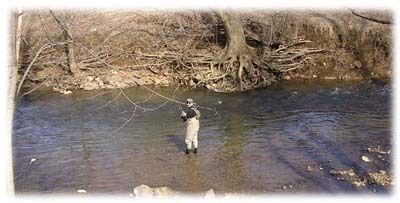 In these bottomlands of Valley Forge, one can wade the clean, crisp waters of Valley Creek, just yards from Washingtons Headquarters, in search of the elusive wild brown trout. At the time of the Revolution, it was the American shad which ran the Schuylkill River in massive schools. Legend has it that the shad ran early in the winter of 1778, provided a much-needed and handy food supply for Washingtons soldiers. Unfortunately, much like many of the industrialized rivers along the eastern seaboard the shad run has been severely reduced, but it is making a comback. 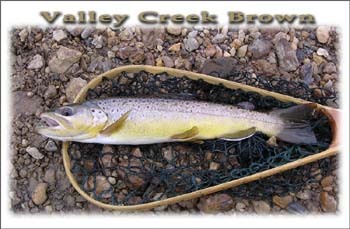 Valley Creek, with it origins as an underground spring, provides the perfect environment for a flourishing wild brown trout population; clean, cold, fertile water. All of this is surprisingly located within one of the most populous areas in the United States and only minutes from downtown Philadelphia. 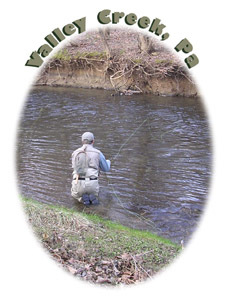 In Valley you will find a Class A population of brown trout. Most are in the 8-10" range, but in most holes there is a 12"+ brownie waiting to pounce on your fly. Valley is an extremely small limestoner - not getting wider than 25 feet - even at the mouth where it meets the Schuylkill. These types of conditions require a stealthy approach, and a rod length of no longer than 8'6". A four weight is all you need. Your basic nymph patterns are the go-to flies - hare's ear, pheasant tails and caddis pupae. Pretty much all mayflies, but the hardy sulphur have been wiped out on this stream. This is by far the heaviest hatch - taking place during the end of May/beginning of June. Some years it does not last long, but if you happen to catch it just right fantastic fishing can occur. A green caddis emerges in April as well. Right place at right time is also the key to this hatch. Unfortunately as of the past few seasons this hatch has not occured in decent numbers. Or it could just be bad timing on our part. As with any wild trout stream we stress catch-and-release, but even more so on this gem. Please get involved to help protect this fishery. Hopefully the future bring more protection to this stream as it certainly deserves it! Give Valley a try and see what it is all about.